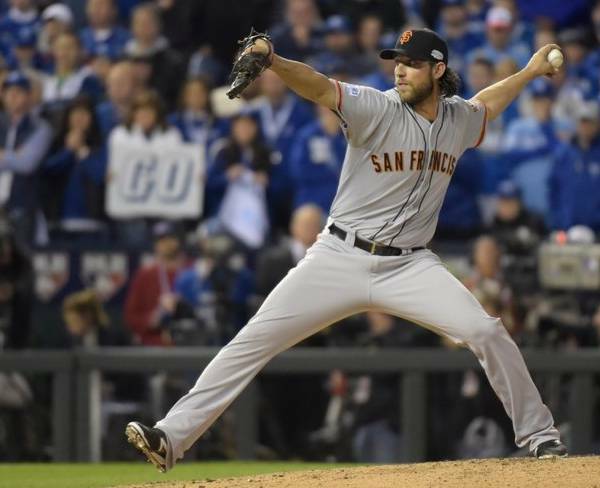 SAN FRANCISCO — After ace pitcher Madison Bumgarner, affectionately known as “MadBum” around these parts, closed out Game 7 of the World Series with five innings of shutout baseball, on top of the sixteen other innings he threw in games 1 and 5, the San Francisco Giants decided he is all they really need. As a hitter, Bumgarner hit .258 on the season, with 4 home runs — two of them grand slams — and knocked in 15 runs. The 25-year-old from backwoods Hickory, North Carolina finished the World Series with two wins, including a complete game shutout in Game 5, the five-inning save in Game 7 to close it out, and an ERA of 0.43. While he was at it, he lowered his all-time World Series ERA to a miniscule 0.25, with a 4-0 record. He finished the season with 270 innings pitched, and went 4-1 with a 1.03 ERA in the 2014 postseason. He passed Curt Schilling for most postseason innings ever pitched in a season (52 2/3), and set the record for the most shutout postseason innings pitched in a row on the road (32). So, yeah, the SF Giants’ plan makes sense.